Preheat boiler to high and position oven rack one below the highest level. Chop half the garlic, all the parsley and all the almonds together with a pinch of salt and a dash of olive oil to make a picada. In a large wide, oven-safe saucepan or paella pan, heat olive oil to medium and add chorizo, peppers and onions. Saute until onions are translucent and chorizo has given up plenty of orange fat. Add half the garlic. Allow garlic to soften for another 2-3 minutes, before adding both kinds of paprika. Stir well and cook another minute or so before increasing heat to high and adding the wine. 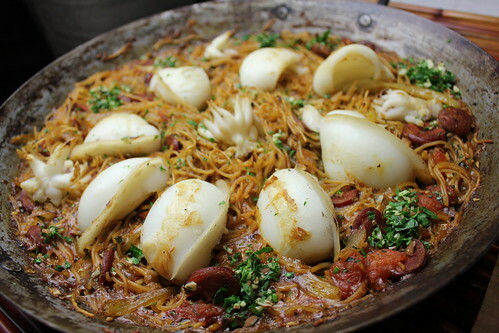 Allow wine to reduce by half before placing noodle nests around the pan amongst the onions, chorizo and garlic. Add most of the stock, reserving about a cup without disturbing the noodles. Then add the cuttlefish/sepia, placing it around the noodle nests. Cook on high, simmering the stock, for about five minutes until noodles start to wilt and liquid is reduced by about 3/4. Give noodles a poke. If they still feel firm, add the remaining stock. If they’re getting towards cooked, add the garlic, parsley and almond picada and stir gently. Then place pan under the broiler. (if your noodles were still firm in step 9, you should wait until they’re almost cooked before putting pan under the broiler. Keep your eye on it and watching it carefully for burning noodles, wait until almost all of the liquid has been absorbed. The noodles and the cuttlefish should now be starting to get brown and crispy on top, depending on your broiler, this could take anywhere from 3-10 minutes.